A few months ago we installed a new set of Drag Specialties forks on our Dyna. After putting some miles on the new front-end, we decided fine-tuning it in order to optimize performance was a good idea. We stopped by Race Tech in Pomona, California to have them install their new Gold Valve Emulators which would, in effect, transform our damping rod fork into a cartridge-style tunable fork. Further improvement to the front end would come from Race Tech's High Performance fork springs. 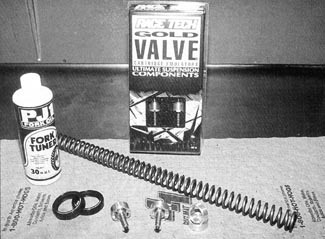 What Race Tech's Emulators do is provide the ability to adjust compression dampening by controlling the flow of the fork oil by using a spring-loaded, flapper valve that can be adjusted two ways. The first being the amount of spring pre-load, the second being the thickness of the flapper. Since rebound dampening is based on the viscosity of the fork oil, the desired weight of fork oil is the first thing to be determined. Once that is set, the emulators are adjusted by setting the spring pre-load of the valve. Increasing the pre-load will stiffen the fork during compression, but has no effect on rebound. With the Emulators in place, the most significant difference in the bike's ride is much less front-end dive when braking and cornering. This lets the suspension do what it was designed for-absorbing. 1.To get started, Race Tech's Kaipo Chung removes the front wheel and fender followed by the fork legs. 2. Disassembling the forks is easy. The allen bolt holding the lower leg in place is removed, then the fork tube is separated from the lower leg. 3. In order to determine the replacement spring rate, Race Tech's suspension wizard Jason Lewis checks the original spring in a digital spring gauge. 4. Even the viscosity of the existing fork oil is checked to help in the tuning process! 5. With the forks completely disassembled, the stock dampeners are modified by having their compression holes drilled out to 5/16". This is done to allow maximum oil flow without weakening the unit itself. The Emulator can then be set to control the compression dampening. 6. Setting the pre-load on the Emulator is easy, Kaipo turns the adjuster clockwise two full turns after it comes in contact with the spring. 7. To be sure both sides match, the distance fromt he valve body to the adjuster is measured with a caliper. 8. ... and installing a new fork seal. 9. The emulator is dropped in place, followed by the suppliedwasher and the fork spring. 12. ... and a length of the supplied tubing is cut to size for the desired amount of pre-load. 13. Before final assembly Kaipo adds the PJ1 for oil. 14. The Race Tech crew measures the bikes' static sag, and we head out for a test ride.